= Bukiyou dakedo, anata no koto wo omoi nagara kono tsuru wo orimashita. 今日は、皆さん！( = Konnichiwa minasan!) Hi everyone! We recently received a request from J-san. He has been helping homeless people, and he wants to be able to sympathize without sounding patronizing. He wants to learn vocabulary that he can use to let them know he is thinking/caring about their problems. So I will try to make a lesson not just focusing on helping homeless people but also people in trouble around you. I’ll teach you some useful expressions that you can use when you want to show your concerns to people and to offer them help politely. It might be a bit difficult, but as usual, please pick whatever information that you think is useful from this lesson! First, let’s look at today’s verb. 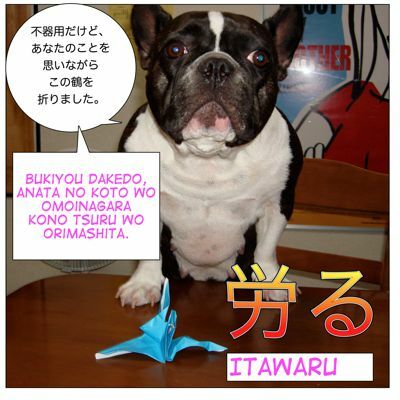 労る/いたわる( = itawaru)　We don’t always use kanji for this verb — just use hiragana. •体を労る ( = karada wo itawaru) to take care of one’s body/health. = Okarada wo itawatte kudasaine. = Please take care of yourself. = Kare (ni)wa itawari no kimochi ga nai. = He doesn’t have a feeling of caring.→He doesn’t care about others (who are in trouble). = To walk caring about the injured leg. To favor the uninjured leg and not use the injured one. = Hito wa itawari atte ikite ikanakereba narimasen. = People have to live by caring for each other. synonym : 大切にする ( = taisetsu ni suru) 気遣う ( = kizukau) (check our 気 ( = ki) lesson!) to care / to be concerned. To treat people (people in general, sick people or people in trouble) with care or in a sympathetic way. = Kono tsuru wo orimashita. = (I )folded this paper crane. 折り紙 ( = origami) : Japanese traditional paper craft which you make by folding a piece of color paper. It usually use just one piece of square color paper without glue or cutting with scissors. Japanese small children learn this at kindergarten or elementary school. 鶴 ( = tsuru) a crane is a symbol for long life. = Cranes live for 1,000 years and turtles live for 10,000 years. So cranes are considered to be a symbol of good luck or long life. 1,000 paper cranes are called as 千羽鶴 ( = senba zuru). People fold each paper-crane and pray for the recovery from a long lasting illness of their close friend or family and put all the 1,000 cranes together in the end and give it to the sick person. It is also considered to be a symbol of peace. Now going back to J-san’s email, how can we express our feeling of caring without sounding patronizing? = Please hang in there!/Good luck! For the more advanced students, there are also longer appropriate sentences for each situation like some of the below. One thing you want to remember here is that we tend to avoid direct expressions in Japanese. = I want to help you. Of course we do say this in certain cases but it is too direct and too dramatic for most situations. = Oyaku ni tatetara ureshii desu. = Ochikara ni naretara ureshii desu. As many of you already know, we often avoid finishing a sentence in order to make it sound softer. The listener will finish the sentence in their mind. = I am busy tomorrow (but)..
= Ashita wa isogashii desu. = I am busy tomorrow. Also we have to be humble. to offer something physical or intellectual. Note : Even if you don’t finish the sentence after ですが…. ( = desuga…) people would understand that you are willing to help them. 気配り表現 ( = Kikubari hyougen) Caring expressions for people in troubles. = Genki wo dashite kudasai. = Iroiro taihen kato omoimasu ga douka ganbatte kudasai. =Tsurai kotomo arukamo shiremasen ga douka ganbatte kudasai. =You may encounter some difficulties but please hang in there. Caring about their health is very common encouragement. = Okarada (or (Go)Kenkou) ni ki wo tsukete kudasai. = Please take care of your body(or health). =Amari muri wa shinai de kudasai. = Don’t be so hard on yourself. / Don’t work so hard. / Don’t do too much. = Kaze hikanai you ni ki wo tsukete kudasai. =Please be careful not to catch a cold. = Samui desu ga douka kiwo tsukete kudasai. = It is cold (or It has been cold) but please take care of yourself. = Kureguremo odaiji ni shite kudasai. = Please take good care of yourself. = Douka oki otoshi no nai you ni. The direct translation “Don’t be too depressed!” /”Don’t be so discouraged.” may not sound appropriate but we use this to encourage them. = Kokoro yori omimai moushiagemasu. = Please accept my sincere sympathy for you. = Hontou ni zannenn desu ne. Mata jikai ganbatte kudasai. =It is too bad. But good luck on the next one! =（I am aware that) you have been through a difficult time. = Watashi ni nani ka dekiru koto wa arimasen ka? = Is there anything that I can do (for you)? = Watashi ni dekiru koto ga areba (nandemo) itte kudasai. = Please tell me anything that I can do. = I will be very happy if I can be of any help to you. = Watashi ni dekiru koto wa kagirarete imasu ga nani ka oyaku ni tateru koto ga areba itte kudasai. =I know what I can do is very limited but please let me know if there is anything that I can do for you. = Nanimo oyaku ni tatenai kamo shiremasen ga nanika atttara itte kudasai. = I’m not sure there is anything I can do, but if there is please let me know. Again you have to be modest! = (Kore) wazuka desuga nanika no oyaku ni tateba ureshii desu. = Kore kurai (or kono gurai) no koto shika dekimasen ga douka tsukatte kudasai. = This is as much as I can do but please use this. = Semete kono kurai wa sasete kudasai. = Please let me at least do this. = Sashidegamashii towa omoimasu ga zehi uketotte kudasai. = It could be uncalled for but please use this. = Kore yokattara tsukatte kudasai. = Please use this if you like. = Sukoshi demo chikarani narereba (or oyaku ni tatereba) ureshii desu. = I will be very happy if I can be of even a little service. I used a lot of 〜下さい。 ( = kudasai) ending in the above example sentences but you will see/hear 下さいね。( =kudasai ne) often in daily conversation. = Karada ni ki wo tsukete kudasai. = Karada ni ki wo tsukete kudasai ne. = Please take care of yourself ,OK? Women prefer to use this ending but men can use this ending as well. It makes the sentence sound softer or sweeter. = Mawari ni komatte iru hito ga itara jibun no dekiru koto kara nanika yatte ageru to iito omou no. = If you see someone in trouble, I think we should start with something that you can do. = Minasan no shiawase wo inotte imasu. = I pray for your happiness. They are both “labor” in English, huh…Let’s see the difference in the following examples. この仕事には時間と労力が必要だ= This job requires time and efforts. Maggie sensei, I really love your lessons they helped me learning Japanese in more fun ways better than my grammar books and Japanese classes. Anyway, could you please explain about the differences between 「気をつけて」and 「注意して」?? Normally if I want to say please be careful on the way I used 「気をつけて」、but what about 「途中で注意して下さい」? I am happy to hear you like my lessons. 気をつけてね= Take care! / Take care of yourself. You also use 注意する when you warn someone. How do you express sympathy and well wishes for someone who has an ill relative through written text? I would like to ask you the differences in usage and nuances between を通して and を通じて. and さまざま because in the dictionary both can be translated as “various”. Thanks in advance. why did you say ka to omoimasu? can’t I use da to omoimasu? You can say 大変だと思いますが、…as well. You usually use か when you assume something. But it also make your quote more polite. Why did she use のが after 会う? And why did she use に after my name? I thought に was only for location and time? 2) に also has a function as an object marker. = Sarah ni tegami wo kaku. = To write a letter to Sarah. = Sarah ni denwa wo kakeru. Could we say: Go shuushou no koto de gozaimasu instead of :” goshuushou sama deshita? Tq. I know things are tough but please hang in there. Is there anything that I can do (for you)? I am trying to get a natural feel for the particle “ni” as sometimes it seems to convey the feeling “by” and “to”. a) Sensei, I know Japanese omits parts of sentences, but if we were to add to this sentence the part “you”, how would the sentence be? b) Is it ok to add a “ga” after “koto” in the sentence? 1) Yes, your interpretation is right. I assume “Maybe there are a lot of hardships” but hang in there. 2) Almost! 私に何かできること”は”ありませんか？ You got に right! I think I answered your question b). 1) Sensei I understand that using “ka” as a way to show assumption is like expressing a question to oneself but at the same time sharing it with the person in conversation. I find that interesting. It’s kind of different to Spanish and English but conveys the same message. b) I have seen that sentence patter before. It all makes perfect sense now. Thank you sensei. 1) Sometimes just one letter could change the whole meaning of the sentence in Japanese. Therefore “か” can be a very powerful letter!! We will learn how to use it little by little, OK? That is the best way to learn language. Oh, you mean “いる＋ある lesson”? sorry. I activated the comment now. a) 彼は家庭があります。= He has a family. b)彼には家庭があります。 = He does have a family. c) 私は弟がいます。= I have a younger brother. d) 私には弟がいます。= I do have a younger brother. They are all correct. に has a function of emphasizing. So b) + d) sounds much stronger. A guy told me “Kaze ki wo tsukete kudasai ne” and I was wondering if it’s just casual and normal to say that. I don’t think any japanese girl ever said that to me. = Kaze ni ki wo tsukete kudasaine. Yes, it is nice and polite. And both men and women can say that.